There’s one week left on my little blue Fiat 500e’s visit, and what better time than to record a video review! It’s going to take some time while Chet Wehe, master videographer, edits the rough take down to a perfect final version, but you can count on seeing a link to it here soon. Here’s Chet setting up the shot. You can see some of my old video reviews on Youtube. The ones with me in them there are my work from 2013. Standing in the back parking lot off the community golf course on a warm Spring morning, I got to say what I think–out loud–about this car. I love it, and am sad to know it’s going to be gone soon. Unlike a weekly press car, this one has made itself at home. My goal of living with an EV has been accomplished, and I know how great they are for me. Electric cars are wonderful for short trips (up to 30 miles or so), because of their charging and recharging limitations, but life is good when you’re cruising down any road under electric power. No vibration, little sound, strong torque, and a sense of just moving forward, not of forcing an engine to do it. Motors are like that. I gave Fidelio a bath for his movie debut, and enjoyed removing the accumulated dirt from his little blue body. As I say in the video, this is certainly the cutest EV out there. Turns out it’s a really effective one, too. No problems, plenty of comfort, generous carrying capacity (despite its diminutive size), clear and full audio, fine brakes. The controls connect you directly to the tires, so you sense where you are. Who would have thought it would be so much fun? I need to consider what to do next. I’d love to own a 500e, but should I hold out for a car with more range? Do I really need another car? Is it important that you love your car? (I certainly think so). Part of the deal with using your EV for daily commuting is that you know you have enough charge to get home. But what if you need to take an extra side trip? Yesterday, I got a chance to meet up with a favorite former boss–but it was 24 miles away–in the opposite direction from my house! I headed south on Interstate 101 from San Mateo to Santa Clara in precommute traffic with a full charge, and was pleased to see 85 miles on the range counter sit there for quite a while. Even with mostly free-flowing traffic, I got to my destination with a comfortable cushion. Heading north along Interstate 880 later, I completed my 33-mile homeward trip and pulled into the driveway with 22 miles left on the clock. Whew. What this meant was twofold: First, I had enough to get where I needed to go, and second, I had to make sure to put my Fiat 500e on the home charger ASAP to be sure there’d be plenty of charge for tomorrow. And that’s what I did. While the major downside to most EVs is limited range, it doesn’t have to be a big deal–if you charge when you can, and for the longer trips–take your other car. It didn’t limit me yesterday, for which I’m grateful. Call it a cult, but EV drivers, I’ve found, are a sociable bunch. We love to talk about our cars, look at each other’s rides, and learn more about the EVs we don’t have yet, such as the Tesla Model 3, which has received more than 325,000 $1,000 deposits in just a few days. I like to group my little Fiat, Fidelio, with other cars, too. Then, I talk with the owners. Sometimes, I just park him near the other EVs and snap away. Here are a few recent shots. This one just happened – One Fiat, two Nissan Leafs, in repose. And for good measure, here’s Fidelio with one of his Tesla friends–also at the office. And, tonight, three members of the Castro Valley Chamber Orchestra brought their cars together for a photo after a two-hour rehearsal. From left to right, Esteban’s 2016 Tesla, Bev’s 2016 Chevy Volt, and Fidelio, my 2016 Fiat 500e. They’re lucky. Although we all just started driving these shiny new cars, they get to keep theirs. But Fidelio has to go back to the fleet in 10 days. I’m sad. When you live with an EV for months, it grows on you. The smooth, quiet ride, the silent cabin where the radio plays so clearly. The never stopping at the gas station. The torque. The Tesla and Fiat 500e are pure electrics, while the Volt–in the center above–is a plug-in hybrid. But the Volt will go up to 53 miles on a charge, so if you don’t travel too far, you can use it as an electric car virtually all the time. In fact, Bev tells me that the new Volt will burn off the gas automatically if it gets too old! In 1964, a song by Gale Garnett filled the AM radio airwaves, called We Sang in the Sunshine. Seems Gale would spend a year with the guy, but then “be on her way.” Why a year? I never understood that arbitary limit. If things were good, why not stick around? In about two weeks, the sweet little Fiat 500e that I’ve enjoyed every day since January 19th is going away. It’s staying here for three months, which is only a quarter of a year, but it’s way longer than the one week that has been the standard visitation period for the last 1,150 plus cars I’ve sampled over the last nearly quarter century. What hurts is that I’ve really fallen for this little car. Over a couple thousand miles, to work and back, off for an errand or a meal or a band practice, orchestra rehearsal, or trip to the post office, little Fidelio, as I call him, has not failed me. When I walk up to him in the parking lot, I still enjoy his retro styling, based on the original, popular 500 of the 1950’s through mid 70’s–Italy’s “Beetle.”Funny, in a way, that Britain’s popular little postwar car, the Mini, is with us in 2016 too, re-imagined for modern times. Like a European 50th high school reunion. I love Fidelio’s light blue paint, an intentionally retro shade. His silver plastic hubcaps look like alloy wheels but are hubcaps just the same, and appropriately so. Small, round headlamps and the proportions of the face give Fidelio a Boston Terrier kind of expression. He’s not grinning like a latter day Mazda or a 1950’s chrome mouthed Buick, but he seems happy and content. Fidelio’s interior is perfect for me, a slim 5-8 man. For being a little car, a Fiat 500e is a tall one, too, so headroom is generous for me–and would be for taller folks, too. The seats sit up high and firm, in a vinyl and sport cloth with jaunty red stripes. The dash features numerous chrome rings around pretty much everything from the instruments to the climate and radio controls to the gleaming door handles that lock when you push them towards the door. In an age of dull gray, plain tan, and somber black interior shades, my little Fiat enjoys a broad stroke of white. The dash panels mimic the painted ones of the original cars, and bring back a nostalgic pang for cars of my youth, with their expanses of painted metal and projecting light switches and radio knobs. All dangerous, but we’re talking about feelings here. One thing about an electric car–especially, perhaps this one. It’s very very quiet in there when you’re rolling down the road–even at freeway velocities. Someone said recently something about double-insulated glass, but I can say that the nicer-than-I-expected audio system delivers crisp, clear, balanced sound on my favorite FM station–KCSM Jazz 91, as well as my favorite Sirius XM Satellite Radio selections. Electric motors spin contentedly, and don’t vibrate like gas engines do. When you press the right-side pedal, Fidelio just moves out, quickly. The torque in the single-speed transmission is surprising and delightful, and the extra weight of hundreds of pounds of lithium-ion battery beneath you guarantees a low center of gravity. While most errands are in town and back and forth to work, I got out on to a few curving back roads now and again, and was once again amazed by the handling and just plain fun of this little beast. Numbers come up in regular car stories for things like engine horsepower, cargo capacity, and fuel economy, along with Government efficiency ratings. In an electric car like Fidelio, it’s all about range. Sure, there’s a speedometer, but you really want to know how far you can go, all based on battery charge. Fidelio’s ingeniously simple center dial displays battery percentage off fullness both graphically with a green left parenthesis and with a number (85%, for example). At the bottom of the dial is the range display, big and bold. What’s funny is, sometimes the range number grows while you’re using power. It means your average is improving based on your recent driving. Downhill, or stop-and-go? That means you’re generating new electricity and using little stored energy. Flying along at 65 on the freeway, especially uphill, takes it away more quickly. There’s a little arrow that goes up or down (or is invisible) to indicate the trend. To keep the range numbers good, I charged my car at work on a Level 2 charger in front of my building. Level 2 means 240 volts. I can fill up the battery from around half full, which it usually is by the time I’ve commuted home and back to work, before lunchtime. Then, with my EV driver courtesy, I move Fidelio aside for another company employee. Charging becomes a routine. You wave your little card in front of the ChargePoint bollard, it beeps, then you plug in the large handle which feels a bit like a gas filler, and then verify the machine is charging. Then, walk away. ChargePoint notifies me with a text message when it notices that Fidelio isn’t absorbing any more charge. Sometimes, I’ll charge overnight at home at lowly 120–Level 1. It can take 12 hours to do what 4 hours does on 240. But it means I have a full battery to use on the weekends. Over my two and a half months of driving, I’ve had to use our family gas burner a few times for trips to visit the grandchildren, or a bass lesson 50 miles away. But nearly always, Fidelio is available and steps up to the job. My upright bass, which I play and also use to measure automotive cargo capacity, fits in the back when I flip down the second row seats. It just barely makes it, and only at a particular angle. But it works. I can also carry a bass guitar and a practice amplifier. If I need my big amplifier–it won’t fit. If it’s an electric only gig, everything slides right in. This is a small car, but a practical one. It’s hard to think of anything annoying about Fidelio, but there are a couple of nits. First of all, the flip-out “switchblade” key often opens in my pocket. Also, the sunvisors are pathetically slim and short, so you’re of luck if the sun is low in the sky as you drive north or west. The Bluetooth-connect, voice-activated telephone dialer works fine for calling numbers in your phone, but if you need to dictate the numbers, it suddenly becomes deaf. And that’s the end of my complaints. Regarding efficiency, while gas and hybrid cars get fuel economy ratings in MPG (miles per gallon), the electrics get MPGe (miles per gallon equivalent). I’ll state my final numbers when my test is over, but at this point, I’m averaging around 135 MPGe–even better than the government ratings. I’ve seen as high as 178 MPGe, depending on the trip. I’d say that’s EXCELLENT. I’d really like to just keep driving in the sunshine with Fidelio for years, but he has to go back to the press fleet and please some other folks. I got him with 79 miles on the clock–just break in time. It’s like he’s mine. 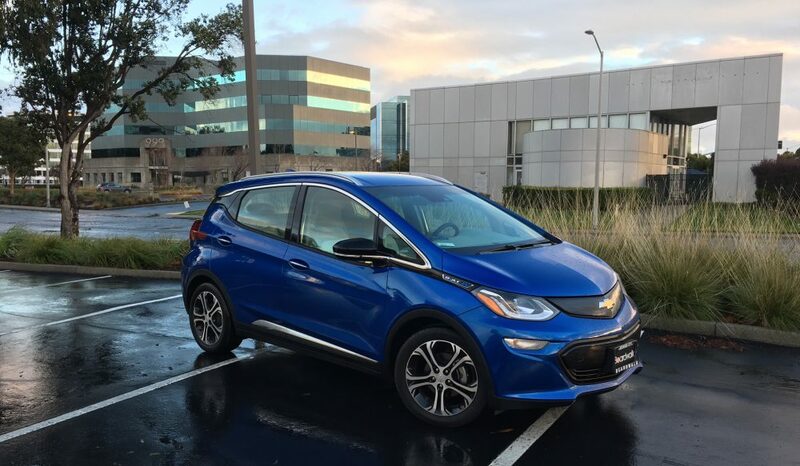 I could go lease my own 500e, but I think I’ll wait to see if the new Chevrolet Bolt EV will deliver at least some of the zip and an honest 200 mile range. Then it would be perfect. But despite the Chevy’s attractive, up-to-date look and game-changing range number, the Bolt and the other EVs can’t touch Fidelio for driving experience and cuteness.